Здесь вы можете прочитать биографию Уильяма Шекспира на английском языке. 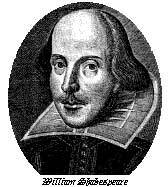 William Shakespeare (26.04.1564 - 23.04.1616) - English poet and playwright. William Shakespeare was born in Stratford-upon-Avon, allegedly on April 23, 1564. Church records from Holy Trinity Church indicate that he was baptized there on April 26, 1564. Young William was born of John Shakespeare, a glover and leather merchant, and Mary Arden, a landed local heiress. William, according to the church register, was the third of eight children in the Shakespeare household—three of whom died in childhood. John Shakespeare had a remarkable run of success as a merchant, alderman, and high bailiff of Stratford, during William's early childhood. His fortunes declined, however, in the late 1570s. There is great conjecture about Shakespeare's childhood years, especially regarding his education. It is surmised by scholars that Shakespeare attended the free grammar school in Stratford, which at the time had a reputation to rival that of Eton. While there are no records extant to prove this claim, Shakespeare's knowledge of Latin and Classical Greek would tend to support this theory. In addition, Shakespeare's first biographer, Nicholas Rowe, wrote that John Shakespeare had placed William "for some time in a free school." John Shakespeare, as a Stratford official, would have been granted a waiver of tuition for his son. As the records do not exist, we do not know how long William attended the school, but certainly the literary quality of his works suggest a solid education. What is certain is that William Shakespeare never proceeded to university schooling, which has stirred some of the debate concerning the authorship of his works. The next documented event in Shakespeare's life is his marriage to Anne Hathaway on November 28, 1582. William was 18 at the time, and Anne was 26—and pregnant. Their first daughter, Susanna, was born on May 26, 1583. The couple later had twins, Hamnet and Judith, born February 2, 1585 and christened at Holy Trinity. Hamnet died in childhood at the age of 11, on August 11, 1596. For the seven years following the birth of his twins, William Shakespeare disappears from all records, finally turning up again in London some time in 1592. This period, known as the "Lost Years," has sparked as much controversy about Shakespeare's life as any period. Rowe notes that young Shakespeare was quite fond of poaching, and may have had to flee Stratford after an incident with Sir Thomas Lucy, whose deer and rabbits he allegedly poached. There is also rumor of Shakespeare working as an assistant schoolmaster in Lancashire for a time, though this is circumstantial at best. It is estimated that Shakespeare arrived in London around 1588 and began to establish himself as an actor and playwright. Evidently, Shakespeare garnered envy early on for his talent, as related by the critical attack of Robert Greene, a London playwright, in 1592: "...an upstart crow, beautified with our feathers, that with his Tiger's heart wrapped in a player's hide, supposes he is as well able to bombast out a blank verse as the best of you: and being an absolute Johannes fac totum, is in his own conceit the only Shake-scene in a country." Greene's bombast notwithstanding, Shakespeare must have shown considerable promise. By 1594, he was not only acting and writing for the Lord Chamberlain's Men (called the King's Men after the ascension of James I in 1603), but was a managing partner in the operation as well. With Will Kempe, a master comedian, and Richard Burbage, a leading tragic actor of the day, the Lord Chamberlain's Men became a favorite London troupe, patronized by royalty and made popular by the theatre-going public. Shakespeare's success is apparent when studied against other playwrights of this age. His company was the most successful in London in his day. He had plays published and sold in octavo editions, or "penny-copies" to the more literate of his audiences. Never before had a playwright enjoyed sufficient acclaim to see his works published and sold as popular literature in the midst of his career. In addition, Shakespeare's ownership share in both the theatrical company and the Globe itself made him as much an entrepeneur as artist. While Shakespeare might not be accounted wealthy by London standards, his success allowed him to purchase New House and retire in comfort to Stratford in 1611. William Shakespeare wrote his will in 1611, bequeathing his properties to his daughter Susanna (married in 1607 to Dr. John Hall). To his surviving daughter Judith, he left ?300, and to his wife Anne left "my second best bed." William Shakespeare allegedly died on his birthday, April 23, 1616. This is probably more of a romantic myth than reality, but Shakespeare was interred at Holy Trinity in Stratford on April 25. In 1623, two working companions of Shakespeare from the Lord Chamberlain's Men, John Heminges and Henry Condell, printed the First Folio edition of his collected plays, of which half were previously unpublished.